Every pageant fan approaches the start of the national pageant with a mix of fear and hope and a singular thought — of ending the year with the dazzling blue Miss World crown. Yes, there is always the silver Miss Universe crown, or the myriad of other newer jewels – Supranational, Grand….but there is something about the Miss World crown and India. This is the contest that defines our pageant identity, the one every girl dreams of wearing, the one we EXPECT to win. We’ve certainly tried: we’ve sent the siren (Manasvi), the top model (Kanishta), the girl next door (Vanya). We tried sending a socially conscious princess in Koyal. We tried a thoughtful, articulate young professional in Aditi. But although some came close, the crown stayed elusive. So what would 2016 bring? I have to admit that the early regionals and city pageants did not make me hopeful. After the spectacular batches of 2014 and 2015, I really felt we were headed back to the morbid mediocrity of 2005 or 2009, and I was secretly hoping that we would have a flood of returnees to save the day. That changed the day I saw Priyadarshini Chatterjee in the lineup for Miss Delhi. Immediately, I thought, “winner.” The last time I felt that way was when I saw Parvathy. But it is a long way from getting the attention of one pageant observer to the Miss India crown! Bit by bit, the group started to form. There were some surprises. The only girl who returned was Sushruti Krishna, who interestingly, I felt was robbed of a placement last year, but was really not on my radar this time around. Others, who I thought ought to have been there, like Elizabeth Thadikaran (the runner up at Miss Bangalore) missed the cut. 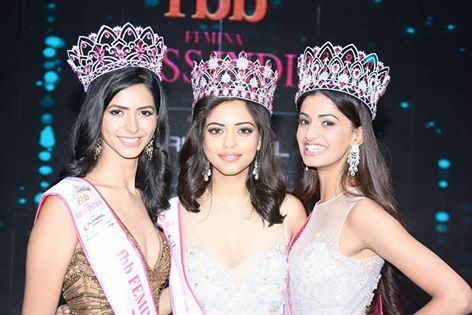 Big favorites from Miss India & Miss Diva – Deeksha Kaushal, Pranati Prakash and Hemali Soni skipped the contest. And a surprisingly strong Campus Princess batch, which threw up a surprise winner in Pankhuri Gidwani, contributed 7 finalists. Finally, a day after the contest started, huge favorite Namrata Sheth withdrew for personal reasons (reportedly a contract issue). The 21 beautiful fbb – fashion at Big Bazaar Femina Miss India 2016 finalists were introduced in gorgeous Indian couture collection by Anju Modi Clothing of the ‘Bajirao Mastani’ fame. 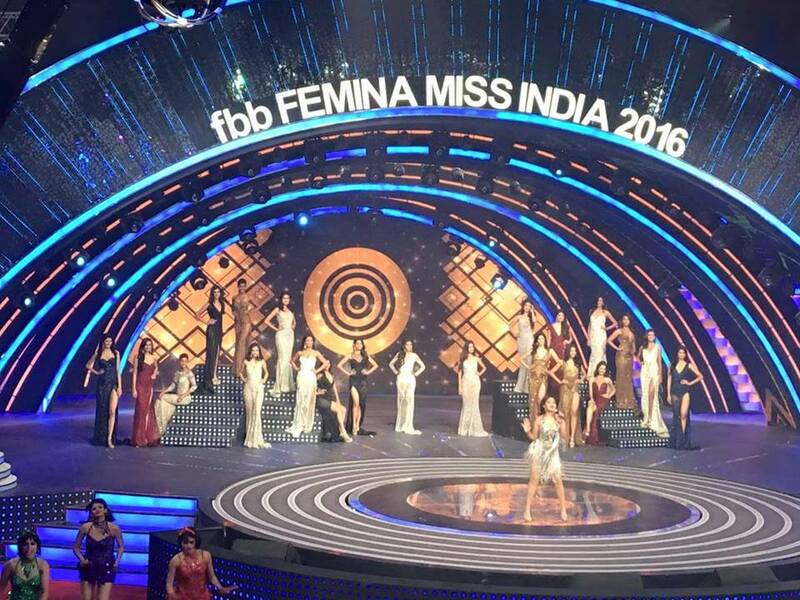 And so we ended up with the 2016 Miss India group. When I look back on it, I will remember it as one of the most consistent groups we have seen in Indian pageants. Perhaps not as strong as 2014 or filled with stunners like 2015, but a batch without any real weaknesses. Almost anyone could have won, and been a decent winner. And as the preliminary month wore on, the confusion only grew, as each girl started to shine and prove herself. While Priyadarshini, Pankhuri and Sushruti were consistently at the top of most lists, Roshmitha’s strong prelim showing, Rajkanya’s obvious strengths on the ramp and Aradhana and Dnyanda’s fresh looks also had many fans. But only one prize mattered, so the real question on everybody’s lips was — was Pankhuri’s vibrance and eloquence, Sushruti’s dazzling smile, experience and social work or Priyadarshini’s beautiful eyes and serenity the winning ticket to Miss World? Heading into the final, the excitement among fans was only balanced by the twin terrors of the Bollywood tamasha and a rigged win by a buttery faced girl. We were all hoping against it, but we’ve all seen it happen too often. What a surprise! Although Colours TV may yet butcher the telecast, at least we can all breathe easy and congratulate Femina Miss India on a job very well done! First of all, the stage was lovely, with the projections that changed the mood for each round and the novel revolving center. Although we had the usual litany of bollywood acts, at least they didn’t completely drown out the contestants. And the contestants!! Each looked stunning – styled beautifully – modern and in a manner that showcased the best of each girl. Gone are the days of the horrible oily Femina bun, and in are current, oh-so-soft waves. I loved that they pulled Navpreet’s hair back to show her face, that they left Priya’s hair a chic shoulder length instead of weighing it down with extensions. Rajkanyah had big bouncy curls, Sushruti was sleek and long. Gone also are the days of Femina’s cut price fashion disasters. This year, we had stunning outfits – from Namrata Joshipura’s shimmery pret line for fbb (who knew cheap could be so chic! ), to the stunning Anju Modi lehengas, complete with nose rings, to the stunning Falguni & Shane Peacock gowns that would be at home on any international red carpet. WOW. THIS is modern Indian fashion at its best. I never wanted it to end, and I wonder if the bar has indeed been set too high! The finalists walked the ramp in the Breath-taking gowns designed by Falguni and Shane Peacock in which the three winners were crowned. But it wasn’t just the styling and the clothes, it was the mood. Again, I don’t know what Colours will do, but I just loved how they changed the set to suit the outfits, and how sets and the music (from the Bajirao Mastani songs in the Indian wear round to the glam Sunidhi rock in the evening gown round which gave it such a nostalgic glamorous feel!) perfectly set the stage for each round. The only thing I would have changed is a more formal presentation of the contestants, with short introductory videos, so that the audience can begin to get to know the girls! There were relatively few surprises in the top 10. 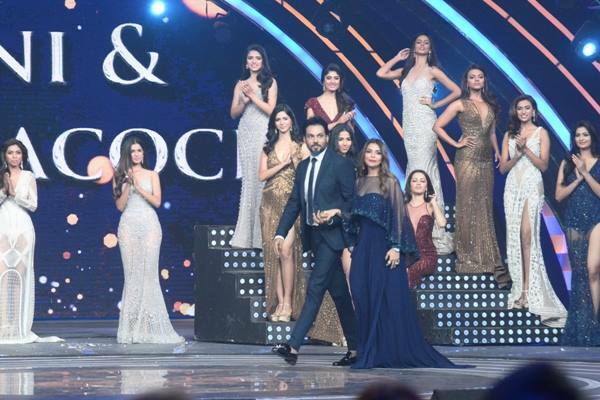 I think most of us were shocked to not see Adya and Rajkanyah included – they were both front runners to me, but then again, it was such an even contest….the top 5 had one big surprise – Navpreet, who was the revelation of the night, looking absolutely stunning. She may have been a surprise, flying under the radar all through the competition, but she was a good one, with a beautiful face, perfect body and well spoken to boot. Pankhuri, Priyadarshini and Sushruti were always expected to be there, and after her strong showing in the prelims, Roshmita was not a surprise either. It was sad to say good bye to some favourites, and I really hope that many of them will return – with a little more experience, girls like Dnyanda, Aneesha, Aradhana and Adya have the potential to shine on any international stage! The success of Sushruti Krishna should be inspiration to them all! As she said so eloquently in her final answer – being able to work for your dream is what makes you a Miss India! It was only fitting that the Badshah of Bollywood, Shah Rukh announced the winners. My personal take? Priyadarshini was a standout from the very beginning. Manish Malhotra, who was one of the judges wrote down “winner” against her name the moment he saw her. Mireia Lalaguna, Miss World 2015 called her an “amazing contestant.” Julia Morley had a big smile at the end of the show. She had to be pleased! I am!! Priyadarshini has a wow factor that I have not seen in a winner since Priyanka Chopra (ok Nicole Faria had it, but she unfortunately went to ME). As much as I have liked many winners in the last several years, Priyadarshini has the blend of qualities that they have lacked. She has the beauty of Natasha Suri, the serenity of Koyal, the sincerity of Aditi, the x-factor of Parvathy, the seductiveness of Manasvi, the elegance of Ami. I think she will be hard to ignore at MW, and if she prepares well, I think she has a better shot at the Miss World crown than any girl we have sent since Priyanka. I think we did just as well with the runners up. I imagine it was neck and neck. Pankhuri’s youthful vibrance against Sushruti’s mature presence. Of course, decisions are probably nothing more than a subjective choice, but I would also guess that the final answer broke the tie. Sushruti just came across as more ready, more sincere. However, with the runner up no longer going to MU, it doesn’t matter much whether you are first or second runner up these days, and both girls are incredibly deserving. So in conclusion, what are my thoughts? Simply that Femina Miss India taught us all many lessons. To the contestants – Sushruti’s courage and hard work is proof that dreams are made into reality in your own hands. Don’t be discouraged – everything happens for a reason. But you control your destiny. If this is your dream, make it a reality! To us fans – patience pays! We have three exceptional winners! I can’t remember the last time I came away from a Miss India contest so satisfied. Whoever our individual favorite of the three, no one can deny that the crowns were all earned the old fashioned way and it was just luck and subjectivity that determined the positions, not politics or favors. That, I think we can all live with!